Shortly after we completed our current antivirus roundup, PC Tools released Spyware Doctor with AntiVirus 2010 ($40 for a one-year, three-PC license), the latest version of its paid antivirus tool. Though it came out too late for us to include in our malware detection testing, we were able to take the program for a quick spin. Spyware Doctor with Antivirus has an intuitive interface. 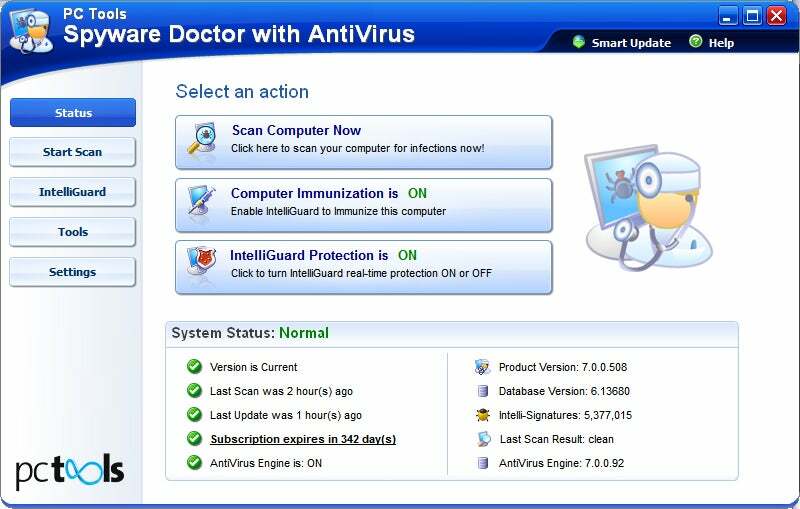 Spyware Doctor with Antivirus (SDAV) has an intuitive interface, with four buttons along the left edge to take you to the app's main functions. The status screen provides a quick overview of your current protection status. You'll know right away whether SDAV and its malware signature files are up-to-date and your subscription is active. IntelliGuard is PC Tools' set of "real-time protection" features designed to shield your PC from various threats. Using behavioral analysis, it can block malware for which no signature exists, along with suspect files and likely phishing or malware distribution sites. The program also includes special modes for gaming (so that active SDAV won't interrupt you when you're playing a full-screen game) and for occasions when you are operating your laptop on battery power (the application will hold off on performing any processor-intensive tasks until you have plugged your laptop into a power outlet). If you are interested in trying Spyware Doctor with AntiVirus 2010, you can download a trial version from PC Tools' Website. Here are some considerations to keep in mind when choosing security apps. A preliminary look at a new paid antivirus application.